This week sees the return to school and for some parents, it’s the first time they will be providing a packed lunch. What to put in the lunchbox is an ongoing dilemma. It needs to strike the right balance between being enjoyable and healthy. If your child doesn’t enjoy it, they won’t eat it, but it should also contain enough energy and nutrients to keep your child on top form for the afternoon session. Variety is key. If your child is a fussy eater or you are short on time, it may be tempting to give them the same lunch every day. Try to avoid the temptation. Eating a wide variety of foods gives everyone the best chance of meeting their nutrient requirements. There is also growing evidence that it could help prevent obesity (Spector,The Diet Myth 2015). Lunch should provide one third of a child’s calorie intake for the day and one third of their required vitamins and minerals. This is much easier than it may sound! So, for the basics. Every child’s lunch should contain some protein, carbohydrates, vegetables and fruit. The protein and carbs are the most important as they provide energy for growing bodies and enable children to concentrate. Try to avoid giving white bread if possible. Wholegrain breads have more fibre and more B vitamins, which provides more energy, helps keep children full for longer and avoids the post-lunch blood sugar crash. 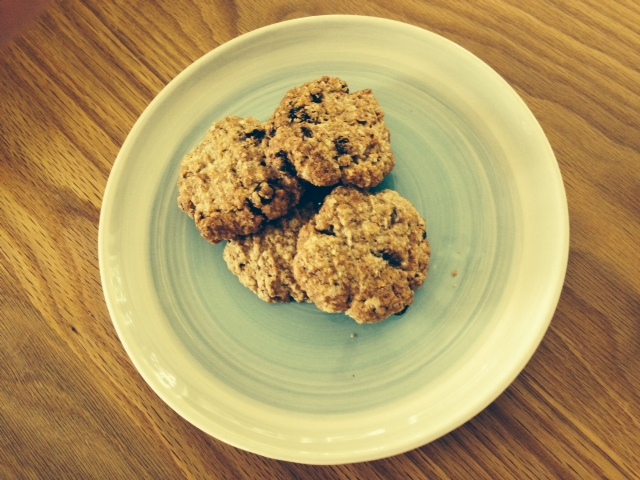 Wholegrain crackers eg. Ryvita with cottage cheese or slices of Cheddar, cucumber and tomatoes. Children need calcium and cheese is a great source. The humble sandwich. Use wholemeal or granary bread, some meat or cheese and salad and you’ve covered all requirements! Yoghurt – natural, full-fat varieties are the best choice as it is much lower in sugar than fruit yoghurts. Add a little honey to sweeten and throw in a few berries. The news this week has probably made you feel even more confused than you already were about what you should and shouldn’t be eating. The National Obesity Forum published a report contradicting the current government healthy eating advice. The report suggested that eating fat could help weight loss and prevent type 2 diabetes, rather than making us fat and causing heart disease, which has been the assumption for many years. It also suggests we should significantly cut our carbohydrate intake. The latest Eatwell plate, produced by Public Health England earlier this year, recommends basing your diet around carbohydrates and choosing low fat foods. This advice has not changed significantly since the publication of the previous Eatwell plate in 2007, except to specify limits on sugar and to recommend wholegrain or higher fibre carbohydrates. The advice to choose low fat dairy products and spreads was not updated. In recent years, research into fat consumption and obesity has shown that despite many people following a low fat diet since the 1990s, obesity rates have continued to rise. Some studies have now demonstrated that eating full fat dairy in particular, may actually be linked to lower body weight and be good for the cardiovascular system. The overall balance of scientific evidence, however, is still in favour of fat being bad for us, which is why Public Health England continues to recommend low fat products. This may very well change over time, but will need large-scale scientific studies to back up the claims. My view is that fat is not the enemy but processed carbohydrates and sugar are, together with a culture of large portions and snacking throughout the day. However, the current popularity of ‘diets’, such as the clean eating movement is not helpful either. Many of their ideas are fantastic – eating wholefoods with lots of fruit and vegetables, but they also cut out grains. Many people who significantly reduce their carbohydrate intake feel tired and lack energy and concentration throughout the day. This can result in a mid afternoon sugar ‘binge’ or eating to excess in the evening as they are starving. Starting the day with a good breakfast, such as porridge or muesli and eating a slice of wholegrain bread with a lunchtime salad or soup is all it takes to balance blood sugar and keep energy levels peaked for the day. Fibre from wholegrains is also really important for digestive health and for the heart. Eating a small amount of full fat dairy and choosing butter rather than a low fat spread is my recommendation, as they are completely natural foods. Moderation and sensible eating may not make headlines, but it should prevent weight gain and keep you feeling on top form. There’s nothing you can do about the weather at this time of year, but eating well can help to boost your responses to it. A good diet can harness your immune system to fight off colds and other viruses that are circulating. It can also top up your body’s levels of vitamin D, which may be low following several months of little sunshine. And the right foods can boost your mood and increase your energy levels. Salmon and other oily fish, such as sardines and mackerel are a fantastic source of omega 3 fatty acids. This type of fat plays an important role in the brain and there is evidence of a link between omega 3 deficiency and depression. Other foods that contain good fats, which may be beneficial for boosting mood, are avocadoes, nuts and olive oil. Wholegrains, such as brown rice contain low GI carbs, which release their energy slowly, B vitamins and magnesium. Eaten at lunch, it can help keep your energy levels constant and avoid the afternoon crash, which can also cause your mood to dip. Magnesium helps the body to relax, especially during stressful times and promotes sleep. Broccoli is another nutrient packed vegetable, full of antioxidant vitamins to ward off viruses and minerals, such as folate, potassium and magnesium. The sunshine is not strong enough in this country between October and March for our bodies to produce useful levels of vitamin D, so by this time of year, our stores may be low. Eating foods such as eggs, fish, butter and mushrooms that contain vitamin D can help top up declining levels. Vitamin D plays an important role in the immune system, as does zinc, which is also found in eggs. If you feel like you may be getting a cold, try making an immune booster juice, either a green juice as above or for something a bit more traditional, juice a large orange, 1/2 small carrot and 1cm piece of fresh ginger. For an immune booster dinner, try making a stir fry with peppers, broccoli, carrots, mushrooms, spinach, fresh ginger and chillies topped with chicken or salmon and served with brown rice. The first week of the new year is always the time we think of making ‘improvements’ to our diet and our lives in general. Festive indulgence in British culture must be followed by penance in January and the media has been full of strict diets that claim to change lives. However, for the vast majority of people, this is simply unnecessary. The latest trend in diets is for ‘clean’ eating, where the emphasis is on fresh, unprocessed foods. This in great in theory, but many of the proponents of this way of eating also recommend excluding all grains, beans and dairy foods. This is hard to manage in a practical sense, particularly if you usually eat with family or buy your lunch out, and in the longer term, you risk nutrient deficiencies. For example, to get your required daily calcium intake without eating any dairy foods, you would need to eat a large amount of green leafy vegetables and nuts every day, together with a cup of soy milk or tinned fish with bones, eg sardines. The other temptation may be to try a detox diet to rid your body of ‘toxins’ built up over the festive period. Many of these are expensive and difficult to follow. They are also completely unnecessary. Your body is built to detoxify itself. It is one of the roles of the liver and just a few days of eating normally and not drinking as much alcohol is enough to make you feel much better. Very strict diets such as detoxes may lead to weight loss in the short term, as they severely restrict calories, however much of it will be water and will be put straight back on when you return to eating normally. In the long term, these diets affect the metabolism and encourage the body to store calories, making it even harder to lose weight. There is an easier way! Use your post-indulgence motivation to make a few simple changes to get you back on track. Get moving – walk, run, go to the gym or an exercise class. Do whatever you enjoy and do it regularly! The holidays may be over and the days getting cooler but there is no reason why we can’t continue (or start!) eating some of the fabulous foods that are ubiquitous in Mediterranean countries. The “Mediterranean diet” is known to be one of the healthiest ways of eating and has been linked with lower rates of heart disease and diabetes and promotes longevity. It includes lots of fish, fresh vegetables and fruit, beans, nuts and olive oil. This diet may be hard to replicate exactly in the UK as it relies heavily on locally grown produce, but there are plenty of elements that can slot easily into your weekly meal planning. We tend to eat lots of fish when on holiday by the coast, including in this country. There is no reason why we shouldn’t continue to eat fish at home. It is packed full of healthy omega 3 fats, which are linked to heart health, good skin, joints, healthy brains and concentration. Healthy eating guidelines state that we should eat fish twice a week. Oily fish, such as salmon, mackerel and sardines is best, but any fish is better than no fish! To make it more interesting, make a simple sauce (see recipe) to go with it or bake it in a bag with lots of herbs. At lunchtime, fish portions such as mackerel can be bought easily from the supermarket and accompanied by a salad. 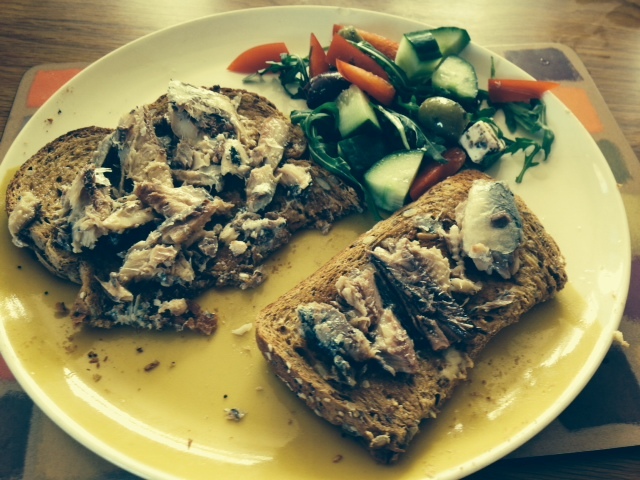 However, for the healthiest, quickest lunch possible, go for tinned sardines on toast! It’s not very fashionable, but you may be surprised at how tasty it is. Make a side salad of rocket, peppers and avocado, squeeze a dash of lemon juice over the sardines, and it’s still ready in 5 minutes flat. Meet-free meals are a normal part of the Mediterranean diet and can easily be done here. Lunches of eggs, cheese or beans rather than meat are simple and having one or two dinners per week of fish, seafood or beans should be manageable for most people. Olive oil is used everywhere in Mediterranean countries and can make many foods taste better. There is no need to buy pre-made salad dressings when a dash of olive oil and lemon juice often tastes as good, if not better. Use it also when roasting potatoes or vegetables in the oven or cooking on the barbie. The best and tastiest olive oil is not the mass produced stuff from Italy. It’s worth spending a little extra on smaller brands from countries such as Spain or Greece. We also associate the smell and taste of herbs such as basil and parsley with Mediterranean countries, but there is no reason why we can’t add them to our dinners in the UK. A pot of basil kept on a windowsill can provide leaves all year round, to be added to pasta dishes, homemade pizzas, roasted veggies or even roast chicken. Salads are often a standard holiday lunch and they can continue to be, at least until it gets cold and we’re craving hot food at lunchtime. Buy some mozzarella or feta, figs and olives to liven up a salad and eat with a slice of grainy bread at lunchtime or as a side for dinner. Locally grown foods are at the heart of Mediterranean cooking. 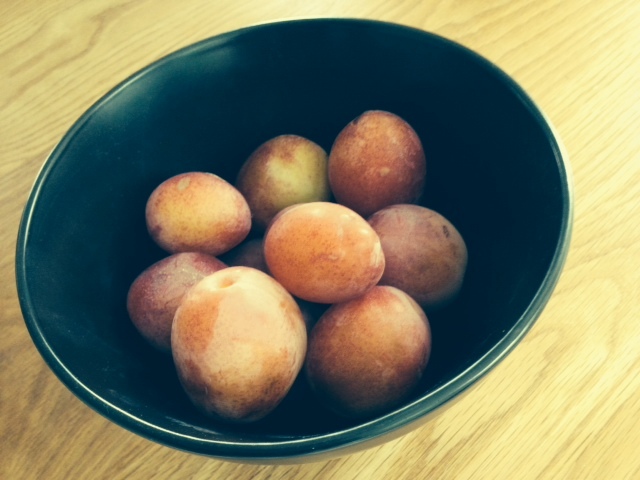 We may not grow the same foods here, but in late summer and autumn there are still plenty around. Try stocking up on tomatoes to make pasta sauces and summer berries which could be frozen for winter. 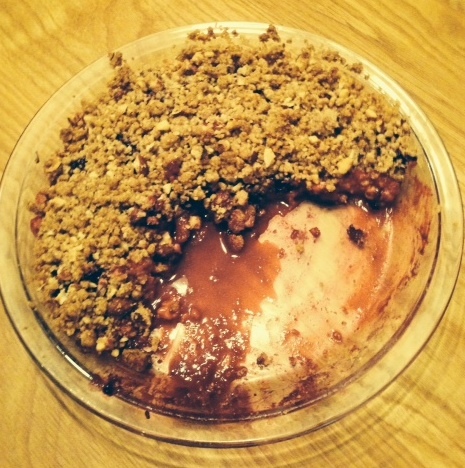 Plums, cherries and blackberries are abundant and super-tasty at the moment and make great crumbles and puddings. Even adopting just a couple of the principles of Mediterranean eating can improve your overall diet and maybe even prolong the sunshine feeling!